A patio swing that has a ripped or missing seat isn't very functional in its damaged condition. You can repair the seat and enjoy the swing by replacing the fabric. A variety of sources, ranging from the original swing manufacturer to specialty fabric shops, have suitable outdoor fabrics that are manufactured to withstand the elements. Look for an accommodating fabric source for your patio swing to suit your needs, budget and personal preference. Acquire fabric from a local shop to quickly restore your patio swing. 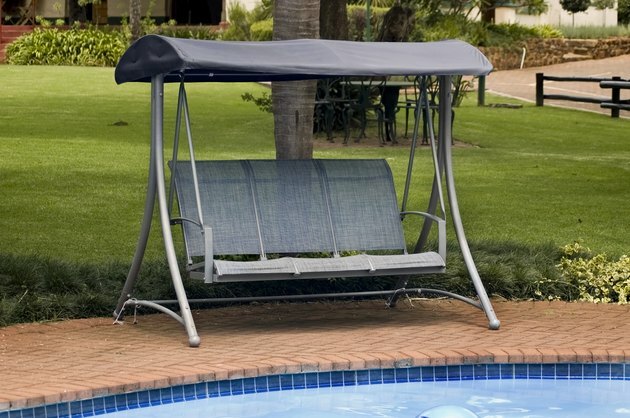 If the seat material has deteriorated or faded, check the patio swing's owner's manual to discover the specific conditions and warranty period for the seat fabric. If the material is still under warranty and meets the stipulated specifications, contact the manufacturer to request free replacement fabric for the seat. The manufacturer may send the fabric directly to your home or may request you visit your local dealer to pick it up in person. Save your old fabric, as the manufacturer might ask you to send or bring it to them. Visit your local fabric shops, custom furniture stores or awning retailer to find a suitable replacement fabric for your old seat material. If you'd like to purchase a new material that's similar to your existing fabric, take the seat material with you. Look for a fabric that's specifically designed to resist fading, rot and mildew from outdoor moisture and sunlight, such as a 100 percent acrylic material.